The emphasis of the PhD Program in Organizational Behaviour and Human Resources (OBHR) is on developing research-oriented academics who study problems related to organizations, including the effects of management practices on people, between people within organizational settings, and between organizations themselves. The Program is not intended for the development of consultants or managers. OBHR Division professors are internationally recognized scholars who represent an array of academic disciplines, including sociology, psychology, industrial relations, organizational behaviour and human resource management. Examples of their research interests include entrepreneurship, organizational knowledge and learning, social networks, family business, territoriality, trust, customer sabotage, power and status, gender and diversity, harassment, and ostracism. OBHR faculty members have won numerous awards for research and for innovations in teaching and pedagogy, traditionally maintaining among the highest teaching ratings in the Sauder School of Business. The norms and culture of the OBHR Division are characterized by highly collaborative and collegial relationships. We provide a financial package that includes tuition plus $30,000 per year for the first five years of the PhD Program. 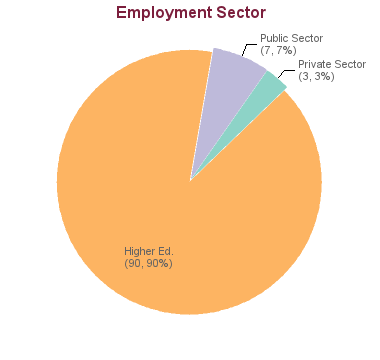 The data show all specializations in Business Administration combined. 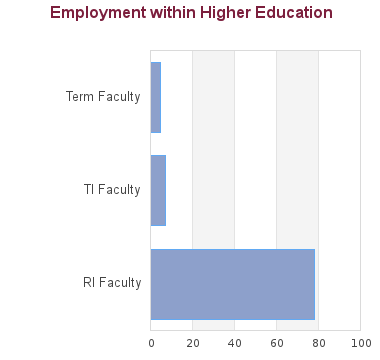 These data represent historical employment information and do not guarantee future employment prospects for graduates of this program. They are for informational purposes only. Data were collected through either alumni surveys or internet research. Almost all of our students secure tenure stream academic positions at graduation. This has included universities in Canada, United Kingdom, United States, Hong Kong, Singapore, China and Australia among others. The following table shows data for all specializations in the PhD in Business Administration combined. This program has a graduation rate of 80.77% based on 52 students admitted between 2005 - 2008. Based on 41 graduations between 2014 - 2017 the minimum time to completion is 1.66 years and the maximum time is 8.00 years with an average of 5.45 years of study. All calculations exclude leave times.